Black Diamond is a sister town to Turner Valley. It has a hospital, shops, hotels and residences, elementary school (K-6th grade), high school (7th-12th grade), hockey rink and a Boys and Girls Club. Black Diamond was so named on account of coal deposits near the original town site. Little oil or gas remains. It is located in the Municipal District of Foothills No. 31. Black Diamond is nestled in the foothills of the Canadian Rockies in the midst of some of Canada's best ranch country. A three-kilometer trail next to the roadway between Black Diamond and Turner Valley is named the Friendship Trail. 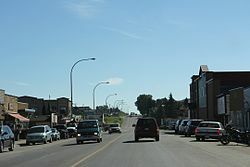 In the 2016 Census of Population conducted by Statistics Canada, the Town of Black Diamond recorded a population of 2,700 living in 1,098 of its 1,108 total private dwellings, a 13.8% change from its 2011 population of 2,373. With a land area of 3.84 km2 (1.48 sq mi), it had a population density of 703.125703.1/km2 (1,821.0851,821.1/sq mi) in 2016. In the 2011 Census, the Town of Black Diamond had a population of 2,373 living in 945 of its 1,001 total dwellings, a 24.9% change from its 2006 population of 1,900. With a land area of 3.21 km2 (1.24 sq mi), it had a population density of 739.252739.3/km2 (1,914.6551,914.7/sq mi) in 2011. The population of the Town of Black Diamond according to its 2009 municipal census is 2,308. ^ "Location and History Profile: Town of Black Diamond" (PDF). Alberta Municipal Affairs. October 7, 2016. p. 57. Retrieved October 13, 2016. ^ Place-names of Alberta. Ottawa: Geographic Board of Canada. 1928. p. 20. ^ Alberta Municipal Affairs (2009-09-15). "Alberta 2009 Official Population List" (PDF). Retrieved 2010-09-14. 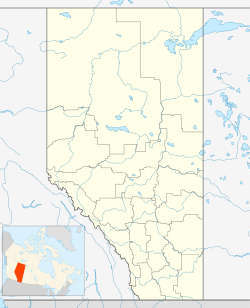 Wikimedia Commons has media related to Black Diamond, Alberta. This page was last edited on 8 July 2018, at 23:36 (UTC).